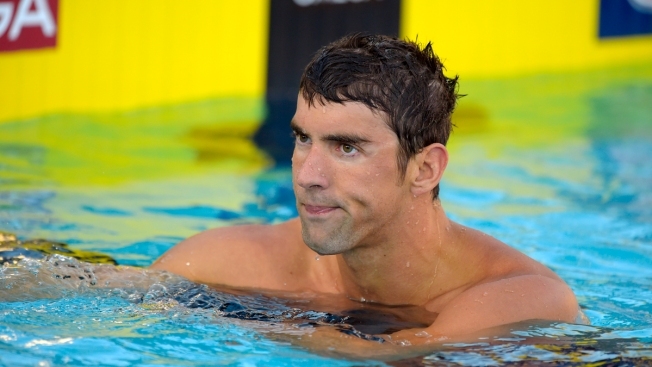 Michael Phelps looks on after taking seventh in men's 100 meter freestyle final at the U.S. nationals of swimming, Wednesday, Aug. 6, 2014, in Irvine, Calif.
Michael Phelps botched his turn halfway through the 100-meter freestyle and finished next-to-last in a star-studded field at the U.S. national championships. Nathan Adrian led all the way to win in 48.31 seconds Wednesday night, claiming his sixth title in seven years. Ryan Lochte was second in 48.96, swimming in the far outside lane. Jimmy Feigen finished third in 48.98. Phelps was last at the turn and straggled home in 49.17, beating only Seth Stubblefield. It was Phelps' worst showing — albeit against the strongest competition yet — since launching a comeback in April. He is focusing on shorter and fewer events than what he did in winning 18 Olympic gold medals. He got no push-off coming off the wall, leaving him with nothing to offer over the closing meters. "Maybe he should have listened to me when I said, 'Everybody go in there and do some turns on the turn wall because it's hard to see," said Bob Bowman, Phelps' coach. Conor Dwyer took fourth, joining the top three on the U.S. team for the Pan Pacific championships later this month in Australia. "That group of eight guys is much faster than what we showed," Adrian said. Bowman agreed, saying, "You get these big guys in a pool and they're all together it usually slows them down. In the morning when there's a couple of them in there that's when they kind of break out." Phelps, the most decorated Olympian in history, has three other events in which to qualify for Pan Pacs. His last long-course national title in the 100 free came in 2005. Adrian and Phelps swam next to each other. After the race, Phelps told Adrian, "Man, I missed the wall." Adrian replied, "Good thing you're the best swimmer of all time. You're going to get on the team." The men's 100 final featured seven Olympians, including five who own individual gold medals. "It's insane the quality of swimmer it took to make the top eight," Adrian said. "There were even some medalists outside the top eight. It's never easy to make a U.S. team no matter who you are or where you're at in your career." Olympian Cullen Jones was relegated to the 'B' final, where he finished third. Lochte is coming off major knee surgery. "This year has been the biggest roller coaster of my life," he said. "I couldn't get anything right all year with surgery and injuries. I am glad I pulled this out, but this is just the start." Phelps wanted to watch a race replay because what he felt and his result didn't match up. "Going into the wall I felt like I had set myself up for a good one just based on where I was in comparison to Nathan," he said. "I thought I had the right distance to go into the wall and when I literally took a couple kicks and I barely passed the flags, I knew there was very little chance that I was going to run anybody down." Phelps has a day off Thursday and will return in the 100 butterfly on Friday. In the women's 100 free, Missy Franklin surged over the last lap to win in 53.43, tying for the fifth-fastest time in the world this year. Simone Manuel, the quickest qualifier in morning preliminaries with a career-best time, finished second in 53.66. Franklin was third at the turn, behind leader Manuel and Natalie Coughlin. "Simone always goes out so fast," Franklin said. "I knew I was going to have to come home hard so I just put my head down." The final featured four Olympians — Franklin, Coughlin, Shannon Vreeland and Amanda Weir. Vreeland was third in 54.14, Coughlin finished seventh and Weir was last. Abbey Weitzeil, a 17-year-old Californian, took fourth, ensuring a trip to her first major international meet. Olympic champion Katie Ledecky earned her third straight national title in the 800 free with a time of 8 minutes, 18.47 seconds — well off her world-record time of 8:11.00 set last month at a meet in Texas. Cierra Runge was second in 8:24.69 and 16-year-old open-water national champion Becca Mann finished third in 8:26.64. Tom Shields led all the way to win the 200 butterfly in 1:55.09, third-fastest in the world this year. His early speed held up over Olympian Tyler Clary, who took second in 1:56.00. Olympian Cammile Adams won the 200 fly in 2:07.12. Defending champion and Olympian Connor Jaeger easily won the 1,500 free, cruising to the wall in 14:51.06, fourth-quickest in the world. Michael McBroom was second in 14:56.17.